The Potential team continue to expand their coupon code platform across the world with the launch of Gutcher.de - the same great service for the German market. 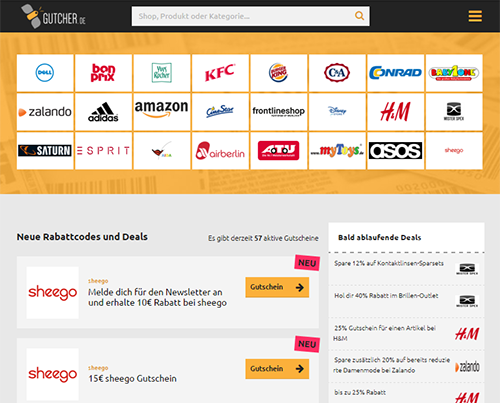 Already serving coupons to online shoppers right now, the website aims to be the most complete and up to date coupon code provider in Germany, listing all the latest offers and deals from stores and other merchants that deliver and cater to the country. New coupons are being added every single day, so be sure to check back regularly. The Gutcher interface will be familiar to those that have visited the flagship US focussed Coupofy site and the rest of the family. It allows online shoppers to easily find the merchant or type of coupon they desire through multiple browsing options and an advanced search bar. Whether it's free shipping, direct discounts, or any other type of deal, you can easily find it at Gutcher. Featured merchants currently on the site include Burger King, Air Berlin, Sprit, Zalando, Dell, Conrad, Asos, Amazon, Sheego, H&M, and many others. All you have to do to redeem a coupon is click on the one you want to use, which will open a window revealing the code and further details, and you can then enter this during checkout on the corresponding website. Coupon codes are simply a word or random string of numbers and letters that you can enter on a merchant's site to redeem a discount or other type of deal. They are the online equivalent of the traditional coupons you would clip out of magazines and hand in at the store, and in fact our sites still offer some printable coupons that you can use in this manner. The concept itself is a marketing tool used by stores and service providers to entice you to spend your money with them rather than the competition. The trouble is it's often time consuming to find coupons when you decide you want to buy something. Gutcher and our other sites simplify the process by listing all of the latest codes in one place, allowing you to find your favourite stores or even search for a type of product so you can buy it wherever there is currently an offer. Our state of the art system ensures our codes remain up to date by automatically searching the web, and our team also manually check them to ensure they are valid. The original Coupofy.com website brought us huge success, quickly growing to one of the largest coupon websites in the United States. Yet that was only the beginning of the journey for our remote team of coupon code enthusiasts. Along with the likes of Bargain Fox in the UK, Savvy Beaver in Canada and Dr Discount in the Netherlands; the launch of Gutcher is one more step towards our goal of providing the most efficient and cost effective shopping experience in the world. Through 2016 we hope to be running in 15 different markets!